I'm still going through the chapters of the first book (Transylvanian Adventures). I've hit a couple of snags in the Research/Investigation chapters and I already had a known issue I wanted to resolve with the In-Between Adventures chapter. The purpose of resolving these issues is to provide two optional "mini-games" for groups to play through if they want to blow through these portions of game prep or pre-dungeoneering. They're essentially "emergent play" engines. I should write a blog on what that means. I'm probably working on that for the foreseeable future. I don't expect to be done before the end of the month. When I am done, the alpha/beta groups will get a "Gamma" copy to review, Hulk up and smash the internet to little pieces because they will be irradiated with awesomeness (I hope). I've also been going back through the Quickstart. It's drafted but there are a couple of issues I ran into with mapping it that will require a minor rewrite of a couple of room descriptions. I'm also going back to rewrite the adventure setup. The intent is to give players a feel for what the Research/Investigation system will bring to the table. I should be wrapping this up within a week. I've just (and I mean just) completed the adventure map. I've included a preview image of it below. I've also completed one piece of interior art, have another just beyond sketching and have sketched a cover piece. I'd anticipate those will take a few weeks. One of the alpha/beta group has put me in touch with a playtester who really, really wants to write some adventures for TATG. I'll let him reveal the details when he's ready. But his ideas for adventures sound amazing. Freaking amazing. I've been too busy to do much on the How-To chapter (which still needs drafting). I have been able to flesh out a rough (new) outline, however. Sorry that I won't be finishing the Choose-Your-Own-Adventure tutorial. But that thing went pear-shaped real quick. Around two-thirds of the book is done-done. As in REALLY done. The blockers now have all been listed above -- Research/Investigation improvements, In-Between Adventures improvements, How-To draft. Thanks to everyone for the patience. This has been a long, hard road. Hopefully, Book 2 goes faster and Book 3 goes even faster. Once I get things drafted and into layout, I'll start doing little blurbs on the chapters and how they've changed (if they have). Here's the preview of the Quickstart adventure map. It will be for 4-5 2nd Level Transylvanian Adventures characters (which will be included) but it could be run with 4-5 DCC fantasy characters as well. 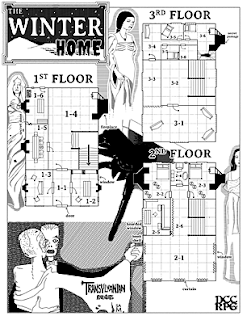 As you can see, there is at least one giant spider, three women in nightgowns and something undead down there at the bottom. It's called "The Winter Home". And I'll find a way to offer it as a free downloadable PDF on Free RPG Day. Transylvanian Adventures has a new logo. The old one from the flyer in DCC was a placeholder. I put that flyer together in about 4 hours, logo, creepy art and all. Didn't have much time to do more with it. I needed a logo and art for the Free RPG Day Quickstart adventure so there it is. I'll also be taking a stab (ha!) at a Land of Phantoms logo too. Land of Phantoms is the publishing imprint I'll be using. Regarding the Quickstart, it's drafted. I need to draw up the map. I've sketched a cover piece and need to drag it kicking and screaming into the line art phase. Beyond that, I'll be doing a few interior pieces as well. The Quickstart has been a great mental exercise for me. In the process of reducing the scope of the rules to just a few pages, I've greatly simplified a number of rule enhancements. In addition, the classes chapter has gotten one further refinement -- each time getting less and less complicated. Right now, Transylvanian Adventures sits comfortably between Dungeon Crawl Classics and Swords & Wizardry on the complexity scale -- meaning it's a simpler game to play than DCC but a bit more complex than S&W. I'm pretty happy about that. The How-To chapter will no longer feature a Choose-Your-Own-Adventure tutorial. I will draft a sample of play instead. What I've been up to recently. Usually I put these over on the forum but I decided this one was a big enough item to put it on the blog. I'm working on the Free RPG Day adventure. It's going to be a doozy. I'll give some more details in a sec. Two of three floors of the adventure are drafted. I have one more to go. I've also sketched out some cover (more like "front page") art and have started working on the map. I intend to make this free "quickstart" adventure a downloadable PDF. It will be available somehow, somewhere... and it will be free. The Free RPG Day adventure will feature some pared-down rules from the first and third TATG books. Specifically, fear, dying, healing up and what crosses do to vampires from the first book and ritual casting from the third book are covered in a very limited fashion. There's an opportunity for the pared-down rules to sneak into the final publication, however, if people feel they rock sufficiently. The Free RPG Day will feature five TATG pre-generated characters -- all first level and likely to die horribly. The classes represented will be the Valiant, Half-Breed, Reaver, Hunter and Exotic. Some of these classes will also be pared down from the book. At most they will be missing one ability or other. This Quickstart absolutely assumes the reader has a copy of the Dungeon Crawl Classics roleplaying game nearby -- as does Transylvanian Adventures. It doesn't explain things like what Luck points do or give you things like Fumble or Crit tables. TATG is a supplement for DCC. You'll need DCC to run the Quickstart or you'll have to improv a few things. My work on finishing the book has crawled to a halt because I shifted my focus 100% to Free RPG Day. Those following the forum probably know I overhauled the Dying rules and that prompted a minor revision of the Character Classes. All that was good stuff and it made the game a lot simpler without sacrificing the fun. I'm more interested in a game that's fun than a game I can write on a notecard. At a minimum, I'm trying to get a cover piece and the map completed for the Free RPG Day Quickstart. I think I'll be lucky to get those in. I'll try to do some interior pieces as well but no guarantees. If anyone has some suggestions or art they'd like to include, I'm open to ideas or contributions. I've been busy on the "How To" section of TATG. The final chapter to draft, really. I had intended to make a "Choose Your Own Adventure" style solo outing to go over some of the rule changes in TATG. And I still might finish it. But I'm about 2/3 of the way into it and... well... it's a slog. The adventure is fine. But I'm having some trouble around all the branching the CYOA format is doing. There's a growing chance that solo adventure may not make it into the book. Just a heads up. I'm hoping to be at NTRPG con in Fort Worth, Texas. I'll update with more details once I get a ticket and a room. If I make it, I'm hoping to play lots and I'll also be up for running DCC and TATG.